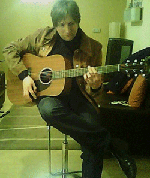 Chris Mckell, singer, songwriter, guitarist. Chris has registered copyright of all his songs with Copyright House. What does listening to The Beatles do to a 7 year old child? Well, for Chris McKell it got him hooked on playing the guitar. He soon progressed from the guitar to the piano, and before long he was writing his own songs. In 1999 he formed his first band, Tinderbox City, where he co-wrote songs with Charles Gill. Chris and Charles went on to showcase their vocal ability by forming a three part harmony, acoustic band called Mckell, Ross and Gill. Chris is now concentrating on his solo music. His song-writing ability has matured and his songs are better than ever. This self-taught guitarist - “I had a few lessons that taught me the basics, but I learnt so much more on my own.” - writes songs in an acoustic rock style reminiscent of The Stones and The Doors. This is merged with a country feel, as his Crosby, Stills and Nash influence comes through, and topped off with some beautiful vocal harmonies. Based in Glasgow, Chris is a highly experienced performer having played at most of the venues in the city. His performing highlights so far have been playing at the Celtic Connections and King Tuts at the start 2012. Chris tries to write one album a year. Whilst currently working on his latest album, he has also been approaching - and impressing - agents. He will continue to gig and write new material until he gets signed up and writes that number one hit!